46-071 Premium Quick Square Layout Tool. 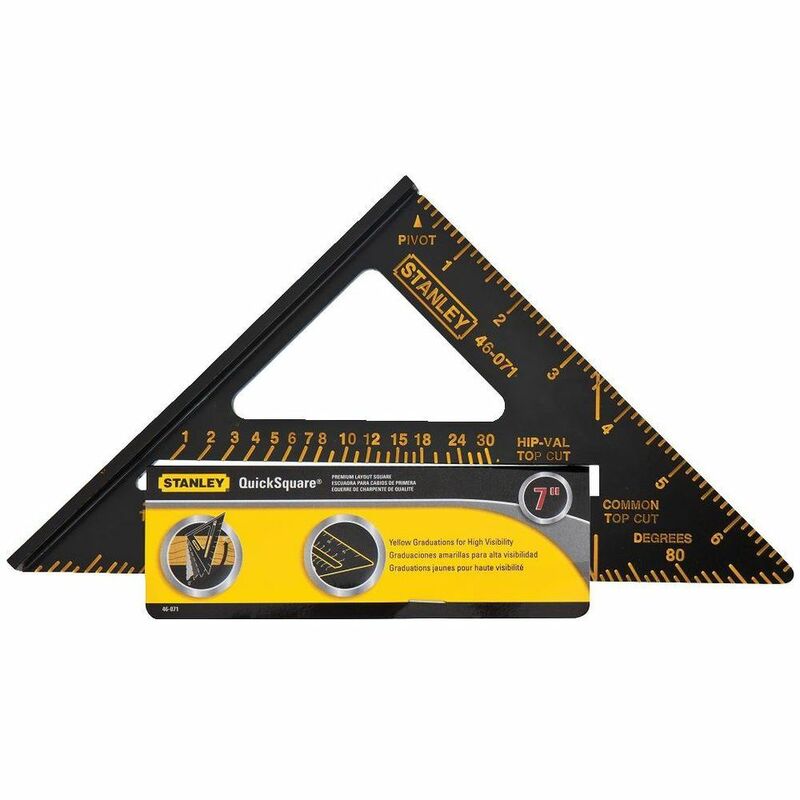 A layout square (sometimes also referred to as a speed square) is a triangular-shaped measuring tool that has a variety of uses in carpentry and woodworking. Layout squares are usually available in 6-inch and 12-inch models, but the 6-inch model is far more common. Even casual DIYers and beginning woodworkers will want one of these helpful tools in the toolbox. The layout square has three major functions. First, and most often for most users, the layout square can be used for scribing square 90° cutting lines on pieces of woodworking stock or framing lumber. The layout square works well when you need to make a square cut on something like a 1x4 or 2x6. Some DIYers even use the square as a cutting guide by holding the square firmly against the wood and running the foot of the circular saw against it while cutting. You will notice a series of measurement markings along the edges and slots of the layout square. These markings allow the square to serve as a protractor, allowing you to mark any angled cutting lines you want. By holding the corner of the square against a reference point on the board, the square is then angled in the way you wish, so you can mark the angled cutting line on the board. This is particularly helpful for tasks like cutting the angle on rafters or stairway stringers. The reference manual that comes with the tool will give you detailed instructions on how to use the square as a protractor for marking. You can also use this tool to measure the angle on a board that is already cut. Determining the angle of a cut is useful when trying to determine the angle for a bevel cut or miter cut on a compound miter saw or for setting the bevel on a table saw. Again, the instruction booklet that comes with many of these squares shows precisely how to use the square to determine an angle. Layout squares are typically available in either aluminum or plastic models. Choose the aluminum, as they're practically indestructible. The plastic ones are a bit cheaper, but they won't last nearly as long.